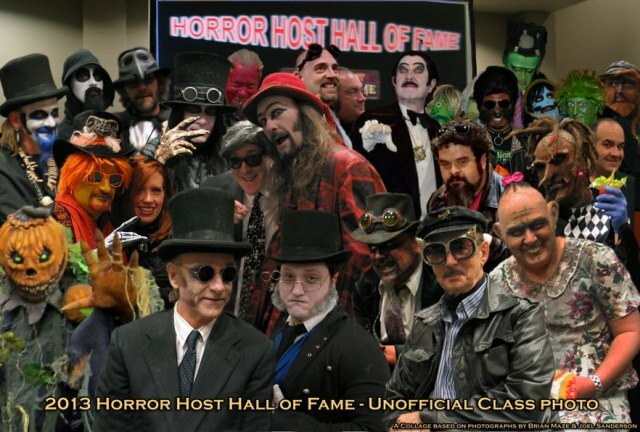 2013 Horror Host Hall of Fame…a Downright Shame! 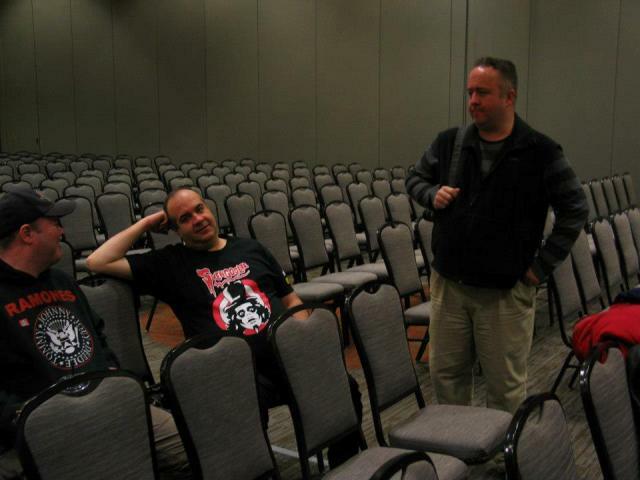 Unlike the last few years, 2013’s March Horrorhound Weekend featured only a sparse number of horror hosts which, in many ways, seemed like a “last stand.” After the Vampira Tribute in 2010, Jason Hignite continued the Horrorhound Weekend/Horror Host tradition with a Zacherley Tribute in 2011 along with “inducting” at least ten horror hosts into the Ripley’s Believe it or Not, Horror Host Hall of Fame. The tradition of choosing ten random hosts for induction would continue in 2012 and, despite the lower turn-out, took place again this year. Halloween Jacqueline the Belle of the Horror Host Ball! While the Vampira Tribute (covered HERE) was a fantastic experience that not only energized interest in horror hosting in general but also helped inspire the creation of this blog, things seemed to go downhill soon after….and this year I think it’s finally hit the bottom! The majority of classic horror hosts were professional broadcasters who proved their versatility to TV stations by adopting their own characters and presenting packages of films. They often stole the show by being more entertaining than the movies themselves and amusing their young viewers via macabre humor and skits. Growing up at a time when monster movies weren’t so readily avaialble, this made them nothing short of gods and goddesses in our horror fan’s eyes. I’m not sure how to explain this phenomenon to those who didn’t grow up with one as you either understand this devotion or you don’t…though that doesn’t make it any less real for those of us who do. 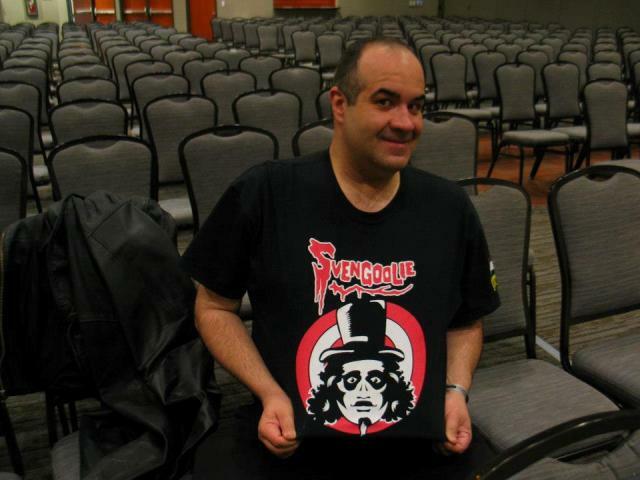 People often tease me regarding my enthusiastic fandom of Svengoolie but my fervor is not unique amongst his nor any other classic horror host fan. I just happen to be more visible and have my own soapbox…not to mention the rare honor of having my host still operating on commercial TV today. That being said, I am a staunch believer that the ONLY people who can properly “induct” or pay tribute to ANY horror host is their fans. I first became alarmed with this event in 2011 when one host induction speech featured something along the lines of, “I didn’t know who (the host) was, but I Googled him and he looked cool.” For the record, I wasn’t familiar with that horror host either but, never the less, it made a lasting impression and from that moment on I was mortified. I started imagining a future induction ceremony where my host, Rich Koz’s Svengoolie, was being “honored” by some PA host from Schenectady who stands up and says, “I never heard of Svengoolie, but his YouTube clips sure look amazing!” This frightening image is followed by my hurling a chair at him; thus turning the entire induction ceremony into an episode of the Jerry Springer Show complete with make-up. I’m sorry folks, you just don’t go around messing with an adult monster kid’s childhood host! Aside from that were mounting questions being muttered behind the scenes such as where exactly is this Horror Host Hall of Fame, if it’s part of “Ripley’s Believe it or Not” what exactly is their contribution, why haven’t living hosts (unable to attend) inducted in past years STILL not been notified of their inductions, and when will those “temporary” plaques given in previous ceremonies (in some cases misspelling the honorees name) be converted into actual statues as promised during the 2011 show? Of course, that last question would not be an issue this year as the plaques were dropped entirely in favor of a PowerPoint presentation. This was considered an acceptable alternative in lieu of none of the inductees being present. Despite these unanswered questions, along with the growing concern that this year’s ceremony was much more of an afterthought as opposed to an anticipated event, my entire purpose for attending the Horrorhound Weekend in Cincinnati was to participate in it. You see, this was the year that my host would finally be inducted and, in keeping with my self-imposed destiny, I successfully campaigned to give the speech. Some participants were told that the ceremony would take place on Saturday at 10am which was the earliest it had ever been. This immediately caused stress among many hosts by hindering their plans to party Friday night and made even more frustrating by the follow-up announcement that there’d be a “rehearsal” an hour before. All information at this point was spread via hosts and myself as we’d randomly bump into each other on Friday. Unfortunately, our horror host “Pony Express” was far from perfect as Dr. David Lady and Dr.Gangrene were under the impression it was still in the afternoon (as in previous years) and missed it entirely. The next morning I awoke at 7:30am and Brian went on-line and reported to me the negative comments he saw on FB regarding the lines at Horrorhound. I wasn’t surprised. While full of costumed monsters, the event itself was comparable to Godzilla! After eating a quick breakfast (which the hotel I stayed at provided), I headed over to the convention center. I wasn’t sure how I was going to get in there early as a long line had already formed but, thankfully, I was to be provided my own beacon via Halloween Jack and Halloween Jacqueline. Their customary bright orange costumes made finding horror host activities MUCH easier so I’d like to give a big THANKS to them. We teamed up and confidently walked past the line, entering the event via the front door (basically strolling with “purpose” prevented confused volunteers from stopping us) and found the ballroom where the induction was slated to take place. 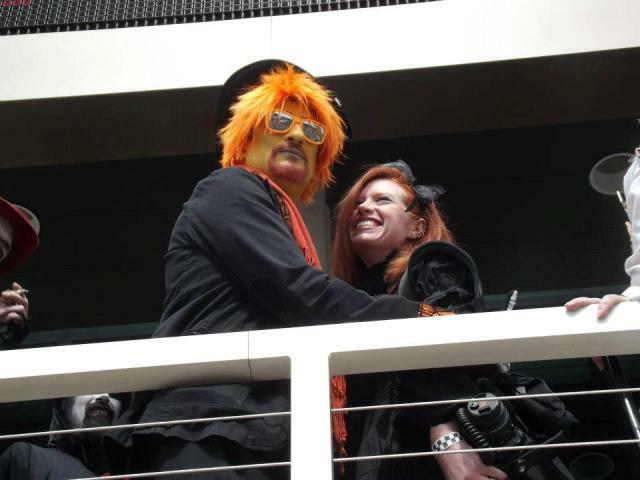 Inside was Jason Hignite along with Jamie Lee Cortese dressed in her signature Svengoolie attire. At least there’d be one person who’d appreciate my speech. The other hosts arrived on time save Dr. Destruction who, amid a fury of angry texts, eventually trudged in around ten. As it turned out, he was smarter than the rest of us as technical issues prevented the rehearsal entirely and we all sat around yawning up until show-time. At last the PowerPoint presentation was operating and we were finally ready to begin. Prior to this, Jason quickly sought out a few people to induct hosts who didn’t have presenters. This was to make up for absent hosts (like the aforementioned ones who weren’t updated on our start time) as well as others that simply weren’t filled prior to the occasion. 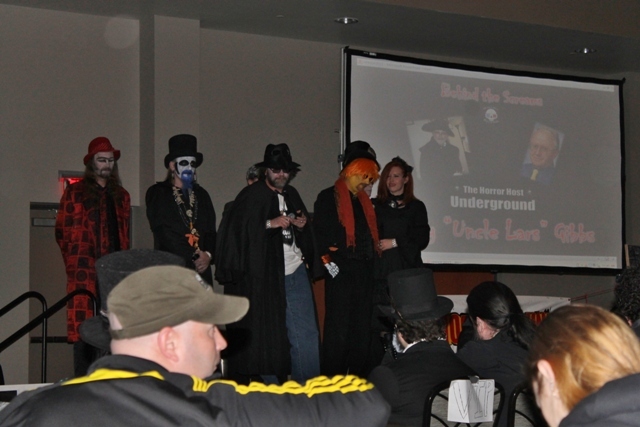 It didn’t make much of a difference either way as, with the exception of Dr. Destruction (who was inducting ToLouse NoNeck), Halloween Jack/Jacqueline (Commander USA), A. Ghastlee Ghoul (I, Zombie), and myself…NOBODY had any clue who the hosts were they were honoring anyway. Even the Emmy Award winning, Fritz the Nite Owl, had his assistant tossing him last minute facts regarding Australia’s Deadly Earnest prior to hitting the stage. With Suspira and A. Ghastlee Ghoul! It begs yet another question…who picked these inductees? I’m not suggesting that any of them didn’t deserve the honor but wouldn’t it make sense to have a fan make the pitch for his/her host and then agree to give the speech or send a pre-taped presentation? This is something that could have been worked out months before the event with very little effort. Instead it seemed to be more about choosing a host last minute and then seeing what costumed host was available to do the speech. I do understand wanting the stage to be more “colorful” but how about having knowledgeable fans pay tribute while having the hosts entertain the audience with skits in between? As the show was about to begin, something seemed to be noticeably missing…like the audience! This wasn’t too shocking since an empty theater would be the natural consequence of having a show slated for 10am at a convention that opens at 11. It’s like going to a department store and seeing a large sign that reads, “BIG ONE HOUR BLOW-OUT SALE AT 8am! Doors open at 9!” The only real spectators outside of myself and the hosts themselves was my friend Russ and Jamie’s parents…all of which had to literally be rescued from the crowd since the convention volunteers had no clue what they were talking about when they said they wanted to attend the Horror Host Hall of Fame. Count Gore De Vol emceed the show and I was the first to go up there. 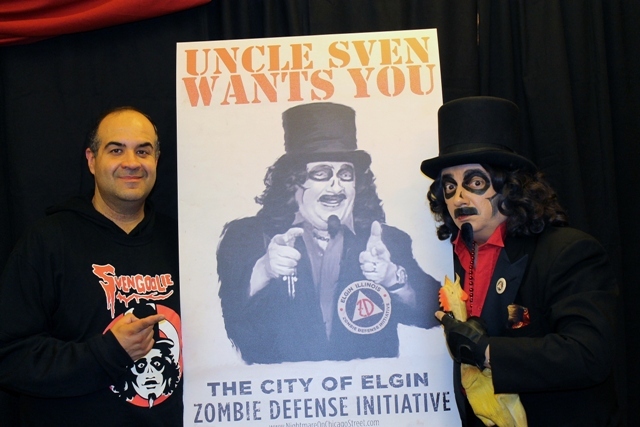 Gore would later hurl a chicken at me which I should have stolen and had Svengoolie sign for me later. Actually, in lieu of the situation, Sven should be more compelled to stand up and whack me over the head with it. Other than standing in front of that aforementioned PowerPoint, I hope I did okay but, in the end, my fears were still realized as my host and his fellow inductees were far from given the proper ceremony they deserved. With zero audience, most of us tired, along with the overall lack of knowledge creating uninspired presentations we may as well have all just gone out to breakfast and toasted our hosts with a glass of orange juice. There were a few warm moments that revolved around I, Zombie as well as a “behind the scenes” tribute to Uncle Lars (see my memories of him HERE) but despite these brief instances of integrity, its unlikely many felt a sense of satisfaction from this event nor that the newly inducted hosts should feel “honored” by it. If I appear overly negative, let me state that I get no pleasure from it. I literally wrestled for the past week on whether I should just write up a quickie/white-wash report or the truth as I see it. This is one of those times when I hate being the lone Terror Dave. Before I’d have sought David’s advice on matters such as these and, in this instance, he’d probably of told me to put a cork in it! At the end of the day, however, I decided it was better for me to be authentic even if left standing alone. Jason is a really nice guy and, personally, I really do like him. Contrary to what I’ve heard from others, I don’t believe he’s trying to create his own “horror host brand” nor does this for his own glorification. At the core, Jason is an adult Dr. 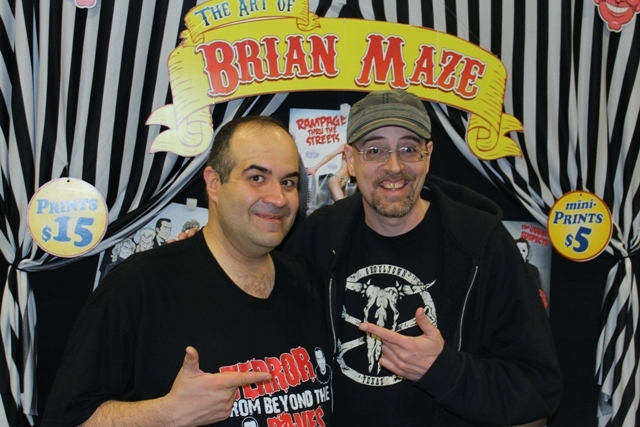 Creep kid who really just wanted to share his fervor of horror hosts and, in doing so, provided both Terror Daves lots of fun & laughs over the years. I also know he’s shelled out a lot of his own money for these events while enduring flack from hosts who didn’t believe he was treating them fairly nor like the superstars a few deemed themselves to be. I also realize that he’s been ready to walk away from this event for months but wants someone else to take it over so it can continue. So the purpose of my rant is not to chastise Jason but to say enough is enough. Just walk away quietly and please don’t bother passing the torch. Unless the convention, Ripley’s, or some philanthropist is willing to provide the ceremony with an actual budget while assembling a small group of enthusiasts to provide proper planning (preferably more than two weeks before the event), then it’s time to close the doors on this hypothetical Horror Host Hall of Fame once and for all. The inductees deserve better and the participating hosts could certainly come up with more entertaining things to do (plus get to sleep in!). In fact, I’d like to see the hosts that attend these events gather on their own accord, choosing an event for which they can all commune and party, ala’ Cinema Wasteland from days of yore. As these are fun people and many are my friends, I really hope they won’t mind inviting an un-costumed civilian like me along too; sort of like a decisively less attractive Marilyn Munster. As for the classic, commercial hosts, they’ll have their own devoted fans and archivists to see to it they’re given proper tribute and respect. If any of these fans should be reading this, I also encourage you to share your tributes on this site. No, it ain’t the Hall of Fame, but it will give outsiders a chance to learn what really made your host special to you (something a Google search can not provide) and why they’d belong in one…a real one! Coming up next…Rock n’ Roll all Nite, with the KISS Gals! 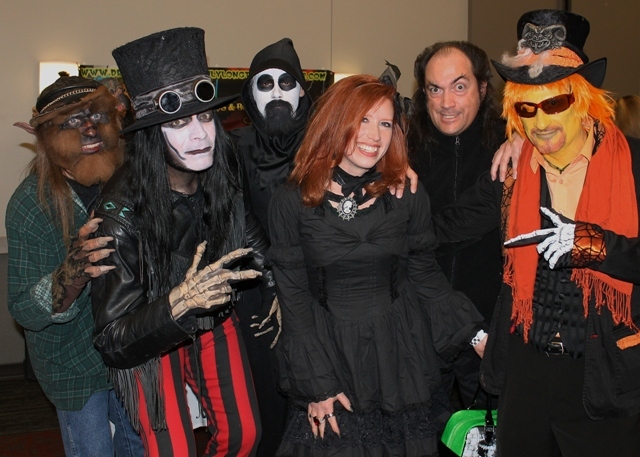 This entry was posted in Convention & Expos, Horror Hosts and tagged Brian Maze, Deadly Earnest, Dr. David Lady, Dr. Destruction, Dr. Gangrene, Halloween Jack, HALLOWEEN JACQUELINE, HORROR HOST HALL OF FAME, HORROR HOSTS, Rich Koz, Svengoolie, ToLouse NoNeck. Bookmark the permalink. 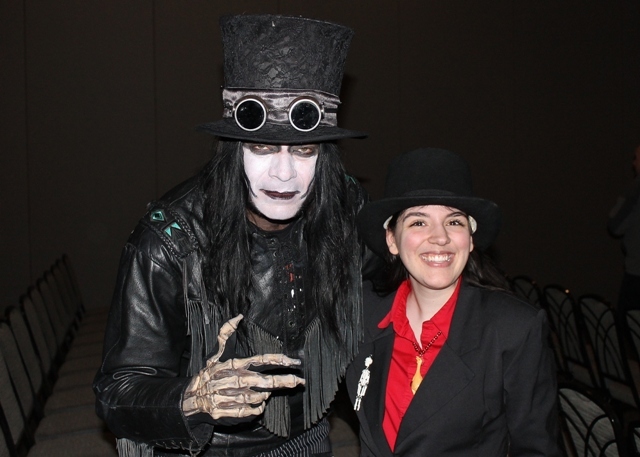 ← 2013 Horrorhound Weekend Part 3: The Costume Contest! It was great seeing you too, Ginger! Thanks for the comment! Thanks for the comments Chris! I did miss the comedy of Slo Frank!